Choose the best for your little friend ! 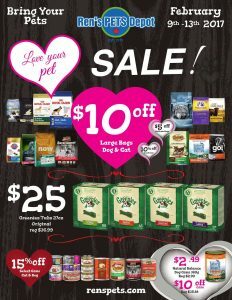 Ren’s Pets Depot Flyer February 13 2017 introduces you many special deals and reasonable prices on this week. Nearly all products are on discounts now ! Today is last day to catch up amazing opportunities. For your lucky pets, you can buy some special grooming products. High quality shampoos and conditioners, brushes, combos, nail trimming, tables, clippers, bladders and trimmers, dryers and bathing products on sale right now. For small animals most delicious foods are available on this special flyer. I will give you some details about their opportunities. Let’s check what you have on this week. Midwest crates & ex pens are on sale up to 20% ! Bowser beds , 20% OFF. If you are looking for some of these selected products , you shouldn’t miss them. The best selections and the best prices always can be found here. Before you get some foods or essentials for your pets , you should browse their flyer or visit their stores. Your pets always deserve the best !